The DS2000, our fully digital brushless servodrive, has been enhanced. Thanks to its improved control features and rationalized design, machine builders now have the optimal solution for accuracy, speed and reliability. This product offers excellent flexibility and performance / cost ratio. 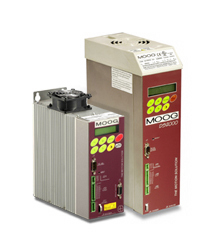 The ability to connect to any input supply voltage. Both resolver and encoder feedback devices can be employed. Within the speed and torque loops we have incorporated digital filters for greater control: users have the capability for both synchronous and asynchronous motor control methods. The facility to control from analog or digital speed reference signals (CAN protocol). Universally understood parameter names organized in a user-friendly format. Fully rationalized control circuitry design and layout yields greater functionality and flexibility. Input power rectification and conditioning section. Inrush current limiting ‘soft start’ circuitry to reduce power supply current on power up. High frequency Switch Mode Power Supply (SMPS) circuitry to feed all auxiliary control circuits. IGBT motor regenerative power control circuit to ensure the excess motor energy is safely dissipated via a braking resistor. The braking resistors supplied with the DS2000 have been sized on medium-heavy duty cycles. Special ballast resistors can be required in case of particularly heavy duty cycles. Auxiliary 24 Vdc control power input available for customer use.